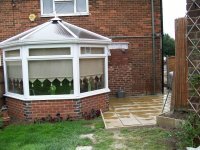 Builders do not get better than Vision Building Services in Mansfield, Nottinghamshire. We are dedicated to providing you with the best building services from small to large jobs. We have 25 years experience in the trade and are fully qualified tradesmen for your safety and peace of mind. We offer our services to the general public throughout Nottinghamshire and within a 60-mile radius of Mansfield. We are a family run business who has incorporated into our business ethics such family traits as honesty and hard work. We are proud to be able to offer you a service with no middle man to deal with, this means that when you choose us you can talk to the people who know their trade and can advise you directly, we also promise that the savings made by disposing of the middle man concept will be passed onto you through our prices. So if you would like to talk to us about our services please do not hesitate to call now on 07721 366800. You can also talk to us using the email form on our contact page. We look forward to hearing from you soon.